I guess most of us associate salad with something green, healthy and leafy well it’s a different case in the Philippines as salad there is commonly associated with something sweet and fruity. 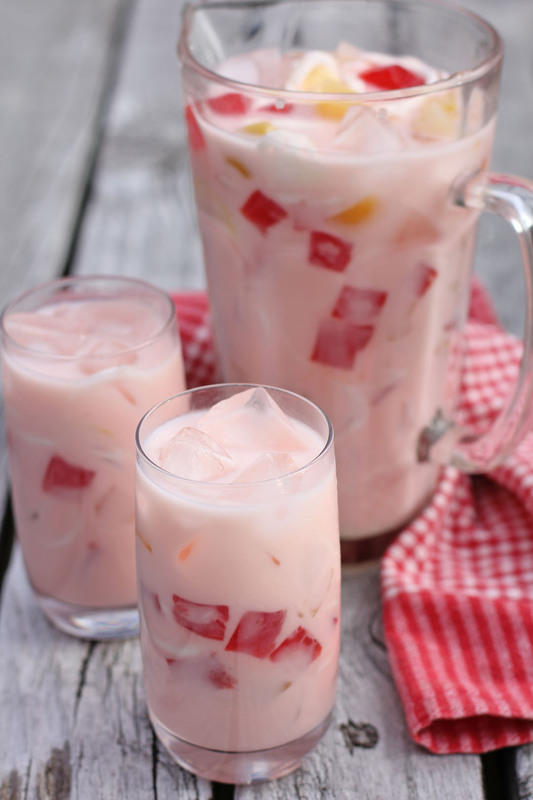 When someone talks about salad in the Philippines by default it is pertaining to something sweet like a fruit salad or buko salad and this drink is inspired from that dessert. Back in my home country I remember this drink was simply called a salad I just added drink to the title to avoid confusion, it is a popular street food which is usually sold together with buko juice, melon drink and the popular sago’t gulaman all together they called palamig which means “to cool you down” which definitely is. It is sweet, fruity and chunky! Is it a drink or a dessert? Well I guess it’s a cross between the two. Combine all ingredients in a very large drink container or a punch bowl. Add lots of ice, let it stand for a while until some of the ice melts then serve. If you are in a hurry you can add some water but not too much otherwise flavour will be diluted. How pretty you need a straw and a spoon to eat this lovely salad. I am sure by the end of April it will be like a sauna in HK and will be making lots of your delicious salads. Oh, I loved this drink as a kid! I’ll have to make some more soon. Raymund: It could not be different. Everything with coconut and condensed milk is delish, delish, isn’t it? What an interesting drink. This is the first time that I have seen a fruit salad drink. I love that you got inspiration from an Asian sweet salad and incorporated into a drink creating something new. There are plenty of sweet salads in the US, although you’re right that “sweet” isn’t the first (or even third) thing we think of when salad is the subject. Really great recipe – thanks. my daughter would adore this. Looks so pretty too. This is one of those drink that you started off drinking then reach for the spoon. Beautiful color and anything with condense milk is at the top of my delicious meter. Interesting and delicious! YUM a dessert in a drink ! Aha, I totally came in here thinking it was going to be a drink with lettuce and tomatoes and stuff! The idea of fruit salad didn’t even occur to me. Looks yummy… bet it tastes lovely with the coconut! This sounds really delish! I’m not from the Philippines, but, what’s nata de coco? I would love to make this for my daughter’s 1st bday next Saturday. One more thing, can I just use coconut cream in the can instead of shredding the real coconut? Its like a crunchy jelly made out of coconut water yiu can buy them in asian shops.